I'm a White Man. And I Think Ujjal Dosanjh is Wrong. His thesis simply doesn't hold up -- and it ignores the valuable contributions being made by non-white commentators. Ujjal Dosanjh wants to empower me to speak out. To quote Vancouver journalist Ian Young, forgive me if I don't kow-tow in gratitude. Dosanjh, a former cabinet minister and B.C. premier, published a lengthy screed on his personal blog this weekend. Titled "The silencing of the white men of the West!," it bemoaned the diminishing place of white men in the national conversation. White men are living under "fear of rebuke from the enforcers of fear," Dosanjh theorized, adding that the country is lacking an "honest debate about the state of equality, race, culture and the place and space for religion and other languages in Canada." The piece was shared widely after it was picked up by The National Post and The Huffington Post. But to be frank, even the most aggrieved white men shouldn't thank Dosanjh for a slapdash piece that was wrong from top to bottom. His first example was Ontario Premier Kathleen Wynne and her assertion that we "can't [allow] security to mask racism" when it comes to the Syrian refugee issue. Dosanjh assumed she was trying to silence honest debate. But Wynne's remarks more likely emerged from frustration with vague concerns about "security" that have a slim basis in facts. Canadians have oft used "security" as a counter to the plan to welcome 25,000 refugees fleeing the Syrian civil war. It's a concern that was fuelled, in part, by the Paris attacks. Dosanjh also raised the issue of Chinese signage in the Vancouver suburb of Richmond, where I live. He claimed that the city council failed to show leadership as signs with Chinese writing -- and with little or no English on them -- proliferated in the city. This issue has persisted since 2014, when a retiring councillor raised concern about seeing a real estate sign with no English on it in her neighbourhood. There has since been a campaign for a bylaw requiring English on all city signs -- and it's fed a broader, and sometimes ugly, debate about how much English should be present in a predominantly Chinese community. Rather than failing to lead, the city has tackled the issue at length. It obtained a legal opinion informing them that any bylaw requiring English on signs could violate the Charter of Rights and Freedoms. So instead, it passed a motion directing staff to encourage businesses to display English on their signs, and even posted a full-time job to make it happen. Surely Dosanjh, a lawyer, isn't suggesting that the city show leadership by violating the Charter? Dosanjh's views on foreign ownership of Vancouver real estate is curious, because his evidence for the silencing of white men here is ongoing and widely discussed research by a Chinese man. Last year, Vancouver urban planner Andy Yan released a study that tried to pinpoint ownership data for some of Vancouver's most expensive areas. It was an attempt to provide research that governments have steadfastly refused to do across the country. The study examined buyers' names and found that 66 per cent of them had non-Anglicized Chinese names, suggesting they were recent arrivals, and that the money to buy property had come from outside Canada. As far as I can tell, a robust debate about Vancouver's future is happening here, with contributions from white and non-white people alike. Yan's work did draw concerns about prejudice from Vancouver's mayor ("this can't be about race," he said). But it also led to robust commentary. Vancouver MLA David Eby used Yan's study to support his argument that the province wasn't doing enough to monitor what could be a major factor in Vancouver's rising home prices. Dosanjh has been a part of my life since I was a child. He was my MLA when I lived in East Vancouver, and he was my premier, and later a federal cabinet minister. He is broadly concerned that people aren't speaking up about important issues for fear of being branded a racist. And it's not hard to see where he's coming from. 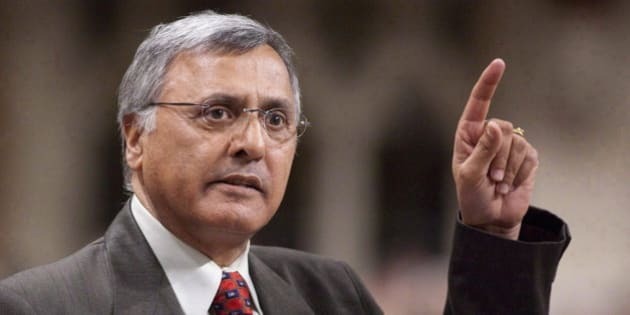 Before entering politics, Dosanjh developed a reputation as an outspoken lawyer known for calling out extremism within the Sikh community. His advocacy resulted in him being horribly beaten with a lead pipe in the parking lot of his law office in 1985. A member of the International Sikh Youth Federation (ISYF), a banned terrorist group, was later charged with the crime. In 2007, he criticized the presence of ISYF logos at a Vaisakhi parade in Surrey. It was a touchy story for journalists who drew accusations of racism simply for reporting on it. Dosanjh's opinions around extremism have been controversial. But they have had strong foundation, and last year, they led to a courage award. But that's more than can be said of his feelings about white men and their place in a debate about Canada's future. His thesis simply doesn't hold up -- and it ignores the valuable contributions being made by non-white commentators. Take the Chinese sign issue, for example. One of the most prominent spokespeople on it has been Alexa Loo, a member of Richmond council -- and a woman of mixed Chinese heritage. She told CBC News that Chinese-only signs were "ridiculous," and offered insight as to why English wasn't appearing. These are insights that a white man couldn't possibly offer and be taken seriously. It's the same thing with the issue of foreign ownership. Chinese perspectives offer insight into trends that could be hurting affordability. In other words, an honest debate is being had about the Canada we want to be ... and more people than just white men are advancing that conversation. White people have long enjoyed a strong platform to influence Canada. They still do, if the country's roster of newspaper commentators is any indication. If anything, Dosanjh should be lamenting the fact it's taken this long to welcome new voices to the conversation. We shouldn't fear losing a voice we're still hearing all the time.